Lyse Deus is not only the Injury Free Miami Program Coordinator, she is also South Florida’s Injury Prevention Center, Forward and Defense. Ms. Deus was hired with a Master’s in Education and began with the Injury Free Coalition for Kids of Miami eleven years ago as an injury prevention educator. She has been particularly instrumental in the education of communities with specialized needs. Her native language of Haitian Creole has served as a great asset. Whatever was needed, she found a way to make herself fit that need. Injury Free-Miami has a large red “Injury Free Bus.” While Isidrio Perez is the main bus driver, a second bus driver was required and Lyse stepped up. She obtained her CDL license and she drives the big red bus where ever it has to go across Miami-Dade. She is also responsible for maintaining its educational exhibits and scheduling. Lyse Deus continuously increases her education, as well as that of her staff. Early in her tenure, she sought training at Johns Hopkins Injury Summer Institute and became a CPT Instructor. 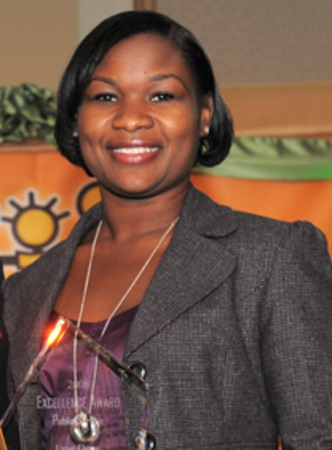 Ms. Deus advanced to the leadership role of Miami’s Program Coordinator. Lyse connects with everyone in Miami Dade County. Literally, everyone. She trains all child service providers in Miami-Dade County in injury prevention, home visitors, early childcare providers, afterschool programs, child abuse and neglect counselors, camp programs, everyone in unintentional and intentional injury prevention. She has maintained grants with The Children’s Trust, the site’s lead local funder for over a decade. Under her leadership the site’s performance scores are consistently well over 95%. The most important part of that is that these service providers never expected to do injury prevention. It wasn’t in their plan or their contracts. They had to be convinced – persuaded really, by Lyse. She persuaded them through the statistics, the need for injury prevention, but mostly through her conviction, her manner, her expertise, her way with people. Lyse speaks before large and small groups, on radio and television, she has done live broadcasts and she has done them in in both English and Spanish. Lyse was educated in English, Creole and Spanish. She has been a media magnet even for national outlets such as Univision and Telemundo. The Injury Free Coalition for Kids of Miami has always been committed to the prevention of both unintentional and intentional injury. Intentional injury is something the site must focuses on, for firearm injury is a very real and present issue for us in Miami. Unfortunately, Lyse has had up close and personal experience of firearm injury. Even while serving as Program Coordinator, she lost her brother to firearm injury. While unarmed and walking away from an argument, he was fatally shot in the back. Despite her loss, Lyse did not lose her focus. She has kept her team together, continues to keep the community moving forward, and takes on increasing responsibility while mentoring others in injury prevention.